Afghan army soldier Ali Raza searches for land mines with a metal detector during an IED (improvised explosive device) defusing training exercise in 2013 in Jalalabad, Afghanistan. 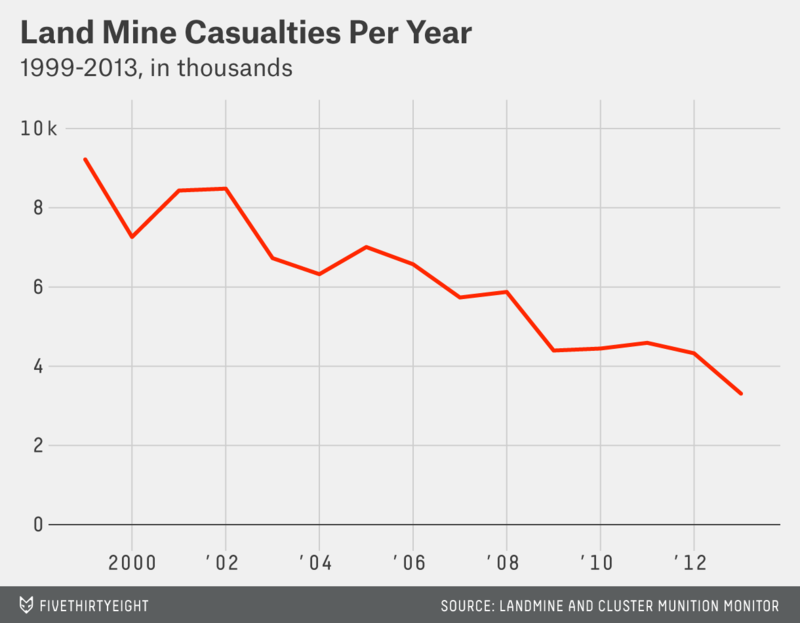 Land mine casualties, perhaps the most brutal and indiscriminate residuals of wars past, fell 25 percent in 2013, marking the lowest number of recorded injuries and deaths by buried explosives since a global disarmament group began tracking these numbers in 1999. Seventy-nine percent of the 3,308 casualties recorded last year were civilians, according to the International Campaign to Ban Landmines (ICBL), which released its annual report Wednesday. Nearly half were children. The group credits these sobering yet dwindling numbers to growing compliance with the Mine Ban Treaty, signed by 162 nations committed to outlawing land mine production. In June, the United States expressed its intent to sign the 17-year-old treaty. It has not yet signed because it is still actively using land mines on the Korean Peninsula. Think of it from this perspective: Three people were spared death or injury by old war mines every day in 2013 compared to the year prior. One of the biggest hurdles is identifying where they are hidden. No one knows how many active land mines remain underground, a figure Abramson said the LCMM has long given up on tracking. It is dangerous work; more than 1,500 de-miners have been killed or injured during clearance operations since 1999. De-mining operators are also at risk of attacks and abductions in places like Afghanistan, Mozambique, Senegal and Somalia where non-state armed groups operate. Eight mine action staff were killed and four injured last year. These high-security-risk countries are also the ones where the most land mine casualties occur. Afghanistan led the 2013 count with 1,050 casualties — nearly half of them children — followed by Colombia with 368, Pakistan with 219, Syria with 201 and Iraq with 124.